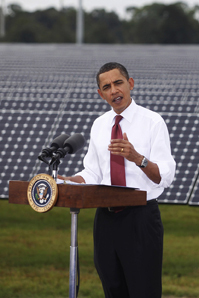 Should the U.S. use more clean-energy sources? Gasoline prices are rising above $4 per gallon in many parts of the United States, causing stress for consumers and political finger-pointing. Conservatives say that government overregulates energy companies and limits domestic production, while liberals want to repeal tax breaks for oil companies. But the larger problem is that the United States has an energy-intensive economy and depends heavily on imported oil. The Obama administration, with support from environmentalists, argues that the U.S. needs to use more clean-energy sources, and that investing in these industries will generate high-tech jobs and export revenues. Republicans in Congress want to cut federal energy spending and rely on market forces to determine which fuels and technologies succeed. Complicating the issue, many forms of energy receive various kinds of government support, although budget debates could provide an opportunity to rethink whether longstanding energy subsidies are still needed.